FILE PHOTO: Sen. Richard Alloway speaks before the John Kasich town hall at the Antique Automobile Club of America Museum in Hershey, April 01, 2016. He says it was a confluence of events that caused him to take stock in recent weeks. For Alloway, who has spent most of his adult life in government service and seemed born to the role of a local politician, the news caught a lot of the state’s political intelligentsia flat-footed. And that, in the rough-and-tumble world of politics, spawned a torrent of rumors. After all, a guy like that wouldn’t be leaving a job like that of his own volition, would he? His resignation takes effect Feb. 28. A special election for the 33rd Senatorial District, which is comprised of most of Franklin County, all of Adams County and smaller portions of York and Cumberland counties, will be scheduled for later this year to fill the unexpired portion of his term. Alloway reached out to PennLive Tuesday and addressed his story, and some of the stories it has spawned. First off, Alloway insisted, in a bid to reassure constituents and colleagues alike at a time where public officials have semi-regularly been felled by personal scandals or corruption charges, there is no other shoe to drop. 1) Alloway, as a junior member of the Senate Republican’s leadership team, has been looking to position himself for advancement to a senior leadership post within the majority caucus. Those senior leaders, in case you’re wondering, wield out-sized power at the Capitol. Think of it as being the senators for the senators. Alloway has come to a realization, he said Tuesday, that there is no clear path for advancement in the caucus room right now. And looking ahead, Alloway said, he doesn’t want to be part of a fight, nor does he want to wait for a better shot, later. “My heart has not been in this as much and my staff knows my heart has not been in it,” Alloway said. 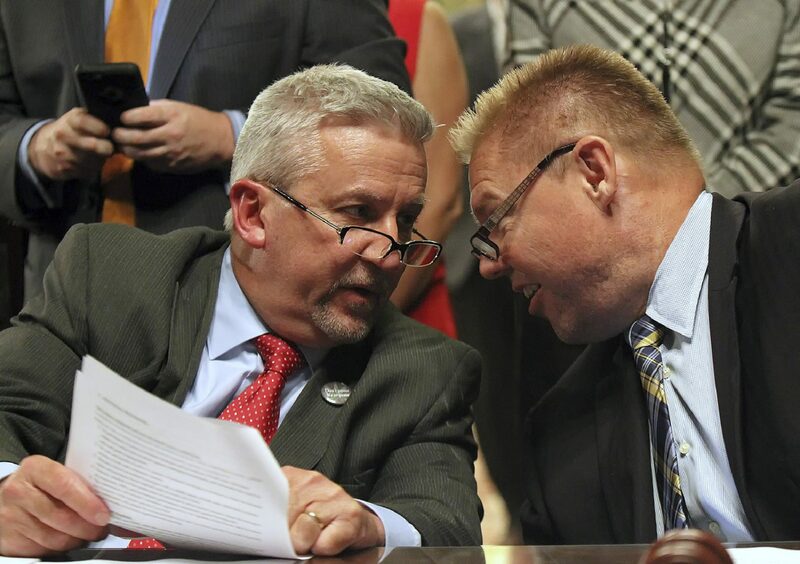 FILE PHOTO: Sen. Mike Folmer, R-Lebanon, left, and Sen. Richard Alloway, R-Franklin, discuss pension legislation in the Rules Committee. The speculation surrounding his decision, he added, hasn’t helped. One of Alloway’s GOP colleagues empathized this week. “A lot of people get so sick and tired of the personal attacks, smears and mudslinging. I can understand when people get fed up,” said Sen. Camera Bartolotta, R-Washington County, who noted she experienced being at the center of unfounded rumors when she first ran for the Senate. Alloway said recent communications from his office including releases citing his goals for the new legislative term where simply part of the course of usual business for his district office at a point where he was finalizing the timing of his decision. Alloway earned a law degree from Widener in 2002, and he says his immediate intent is to re-invigorate a law practice that has largely taken a back seat during his 14 years as district magisterial judge, followed by the last 10 in the Senate. “My plan is to stay in Chambersburg, reopen my Alloway Law office and try and build a business,” he said Tuesday. Alloway will not start from scratch in that regard. At age 50, he is eligible to start collecting a state pension for a combined 19 years of public service employment – including five years as a legislative staffer. At 1 percent of his final salary, of $101,040, or about $84 a month, he is also eligible for lifetime health care and prescription benefits. Alloway said he timed his departure for Feb. 28 so that Lt. Gov. John Fetterman, the new presiding officer of the Pennsylvania Senate, could set the special election for the same date as this spring’s municipal primary, a move that should cut down on the costs.